Screen-in your existing porch with these easy-to-order DIY porch screening kits from Home Porch & Patio Kits. 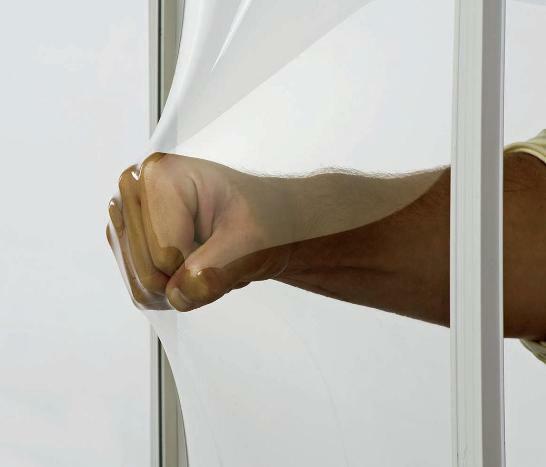 Select a screen mesh that protects from both sun and pesky insects! Build your own screen walls using rust proof, maintenance free extruded aluminum framing and create that backyard, bug-free, 3 season space! 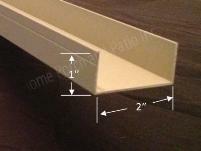 Ideal for taking an existing roof line and creating your very own screened enclosure! Perfect for porches, decks or existing patio covers. This simple and effective framing system is installed from floor to ceiling, wall to post, between your existing support posts and is extremely flexible. This 'do it yourself' kit is classified as a "materials supplied" kit. 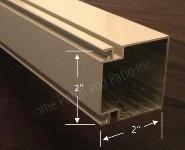 All that means is you will receive the extruded aluminum profiles pictured below in 16' and 20' lengths. You will then be cutting, from those 16' and 20' lengths, the vertical and horizontal lengths that are specific to the size and height of openings that we have suggested for your particular application. All components are screwed together on site and the last step is to screen in each opening that you have created with the aluminum extrusions, using the supplied screen and spline. We supply everything you need (except the hardware to secure the U channels to your existing surfaces), including the screen door, to finish the project! These screen enclosure materials are perfect to create that long sought after outdoor living space at a fraction of the price of having a contractor build it. We provide all the aluminum, screws, clips and screening - - everything internal to the installation. You provide the tools and labor. Our screened wall kits are basically custom designed to fit your specific application. 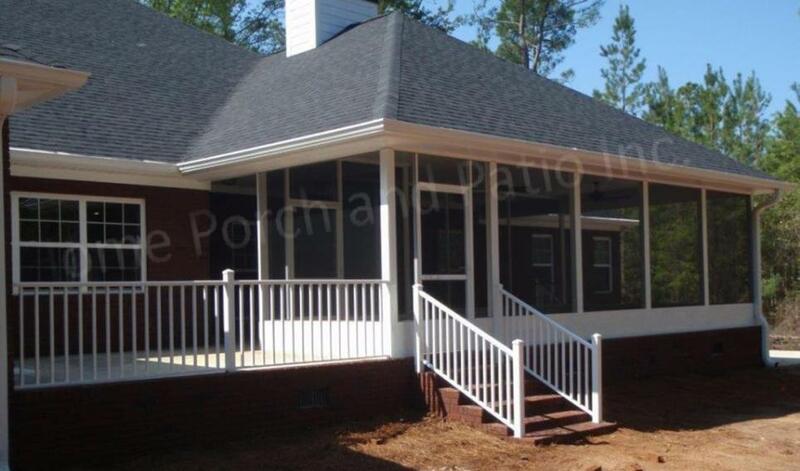 High quality, durable and maintenance free - - all at a price that will not break the bank and it comes with all the help you need from Home Porch & Patio Kits Inc.
You can be confident with the answers we give. Know who you are dealing with! First, the U channels are installed around the perimeter of each of your openings - - on the floor, the underside of your existing structure, up the existing posts and house walls. Typically these are the H123 profiles pictured below and to the right, however if there is a significant pitch on the sidewalls the H124 U channels are used on the underside of the existing roof line. Next, the vertical mainframes are inserted into the U channels. They will be the H121 profiles pictured at the right and below when there is a post or house wall involved (indicated as orange squares in your quotation). If the openings are large enough to require additional verticals, the H122 mainframes (indicated as blue squares in your quotation) will be used. After the vertical mainframes are in place then the top mid and bottom horizontal mainframes are screwed into place between all verticals. If you have chosen the kickplate option, then an H121 horizontal will cap the kickplate. If no kickplate is chosen then an H122 can be placed at your chosen height as a chair rail between verticals. You are now ready to screen each opening using the screen and spline supplied with the rest of your materials. The finishing touch will be to assemble the knock-down door and hang it the openings you have created in your set up (and as indicated in your quotation drawing). was installed to cut the height of the panels into two manageable sections. 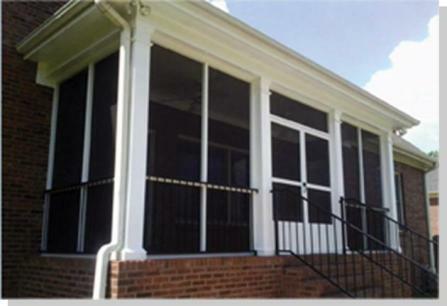 This customer started with an existing roof-line, four posts across the front and an aluminum railing system. They chose the white framing and a no kickplate installation on the inside of the existing railing. They installed the 2x2 chair rail at the same height of the existing hand rail. The opening between the two middle posts was perfect to install a double door application with a center astragal. The doors open toward the inside. Note that a single vertical was necessary in the other openings to make the finished panel size appropriate for screening. 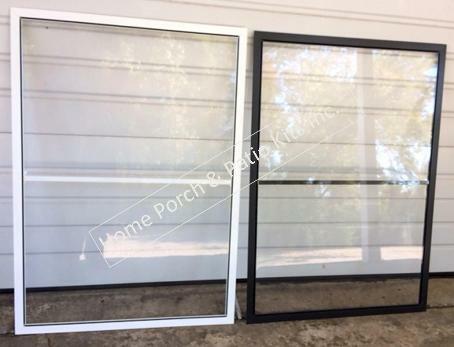 Standard 3' wide x 6'8" tall 'knock down' screen doors are available as an option. You can request as many doors as you need or you can supply your own doors. Also, as an option, you can install an 18" or 24" tall kickplate in the bottom of the screen panels that you build. Should you choose not to install a kickplate, we will supply enough H122 - 2" x 2" mainframe for you to use between verticals as a chair rail. Install this at whatever height you wish. Have a seat in your favorite chair and install it at a height that does not interfere with your site-lines. 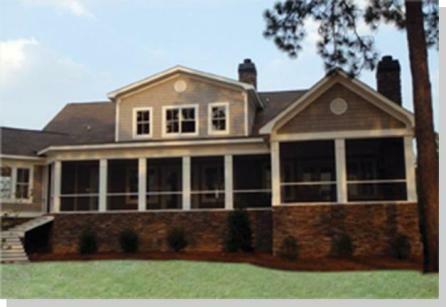 When you submit your request for quotation (click here) we will put together, not only the cost for materials, but a drawing of your application with our suggested spacing of verticals - - the size of screen panels that you will be creating. 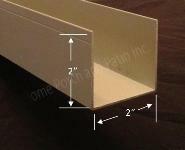 Generally, they will range from 32" to 60" wide panels and it will depend on the entire scope of your project. Standard 18x16 screening is included in the materials supplied. 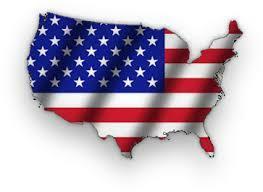 There are a variety of screen types available and can be researched on the following page (click here) of our WEB site. This 'materials supplied' kit is a permanent installation. There is no provision for a seasonal installation with this product. 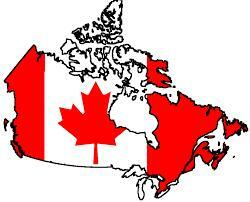 Hardware to secure the U channels to existing surfaces is to be supplied by the customer and purchased locally. The requirement for sealant / caulking for the screen wall assembly is determined by the customer and is to be purchased locally. 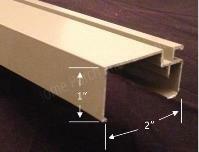 Any requirement for downspout assemblies is determined by the customer and purchased locally.